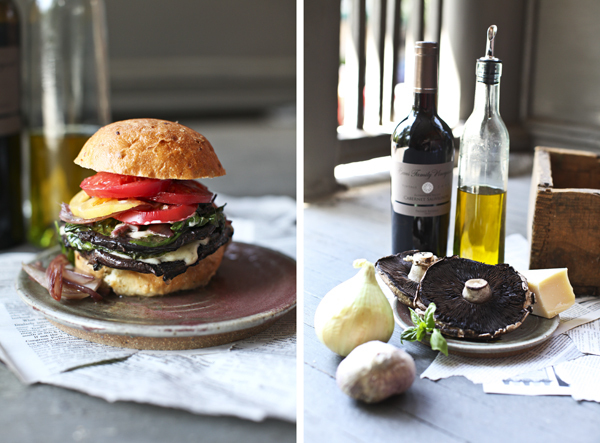 The Portabella Burger — Cohabitate Co. I like a good 'ol traditional burger just as much as the next person, but I have fallen pretty hard for an alternative to the classic. Substituting my 'moo' for a mushroom, I don't get that greasy, over-stuffed feeling that occurs after I down a traditional burger. So, for a healthier, happier you, give this new twist on a classic a try; and red wine is required for this dish, so how can you go wrong. First, slice and/or dice your onion and garlic. You may use as little or as much garlic as you like. Place onion, garlic, and 2-3 Tbsp. of olive oil in sauce pan and sauté until brown and caramelized. While onions and garlic are cooking, sample wine and wash and rise your portabella. Wash well, and remove any stem from your shroon. Once your onions and garlic have cooked, add another couple Tbsp. olive oil to your sauce pan, place your portabella(s) face up in sauce pan, and add 2 Tbsp. olive oil to the face of your mushroom. Sample wine. Add 1/3 cup of red wine to the face of your mushroom as well. That old wine that you have sitting around from an unfinished bottle works great for this too. Cook for 4 min. on each side. Sample wine. Then, turn portabella face-up and lay basil leaves on face, and add a few slices of parmesan cheese. Cover for about 2 minutes until cheese is melted, or until basil is steamed and wilted. Place your re-defined burger onto a fresh onion roll (I picked these up in the deli section), add a few spreads of Nayonaise, top with onions and garlic, a nice slice of tomato and get ready to consume the juiciest burger you've ever tasted. Wash down with plenty or red wine. *Did you know that 2/3 cup of a portabella mushroom contains as much potassium as a medium sized banana and (according to the USDA) is a great source of copper, folate, and niacin.